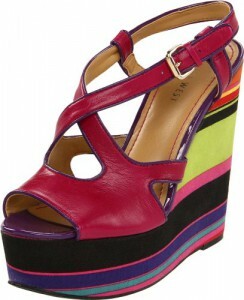 Colors seem to be “IN” this coming spring and lots of loud ones by the looks of this Nine West Boushie Wedge Sandals. As if it’s not enough that the upper is made of a solid pink or orange or turquoise, the actual wedge platforms has even more colors! The 6 inch heels is striped with pinks, greens, oranges, reds, blacks, purples and yellows. The front platform is approximately 1.25 inches only so that’s almost 5 inches to walk with so it’s a good thing the straps are locked with buckles for a more secured fit. It also helps the wedge and outer sole is actually made of cork so it produces the right amount of traction for a more confident walk. My favorite would be the white one because it looks much … simpler if you could call it that. I guess it’s just easier to pair with your wardrobe. I would wear it with maxi dresses and gold and/or chunky accessories. Even if it’s high I still think it’s nice to wear for a walk at the park this coming spring. Buy this Nine West shoe here!